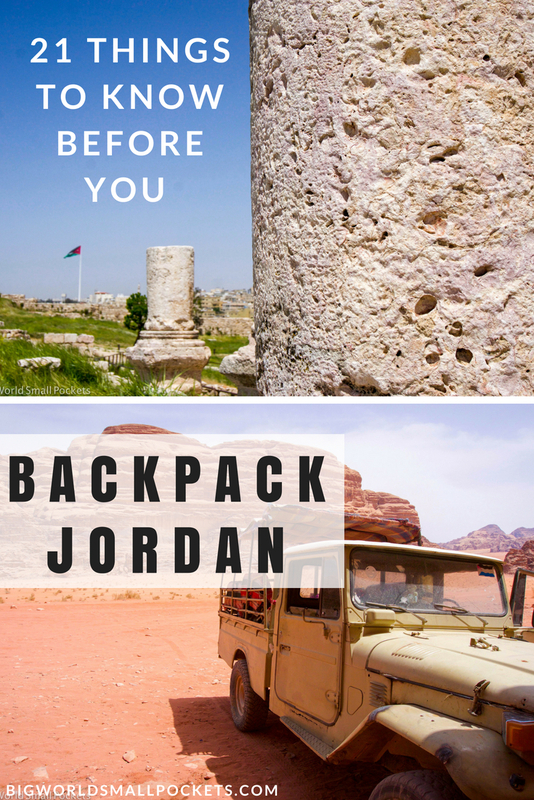 If you’ve never backpacked in the Middle East before, then let me tell you, Jordan is the perfect introduction. 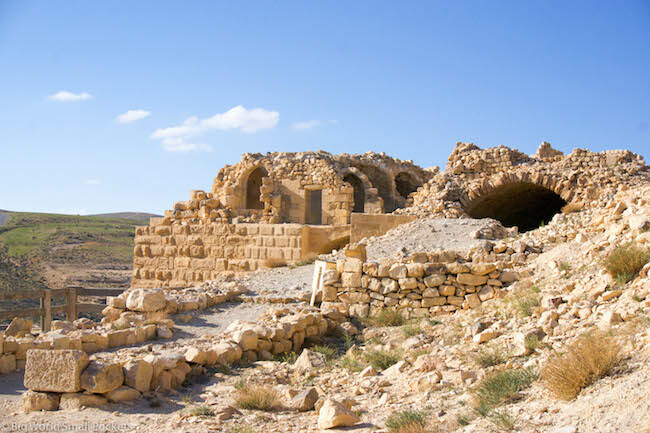 Small, safe, stable with amazing food, some incredible historical sites and very welcoming locals, Jordan is the perfect first foray for shoestring travel into this part of the world. 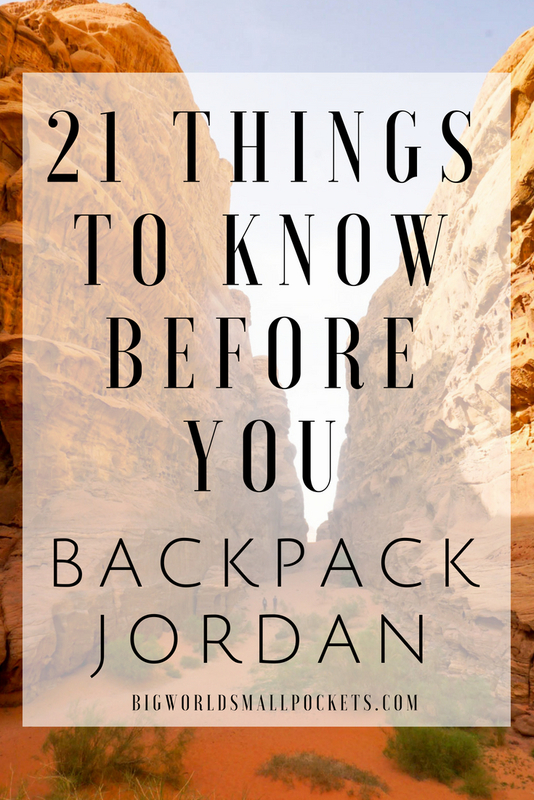 I actually spent almost 3 weeks in the country and loved it, so here, to get you prepared, are my top 21 things you need to know before you backpack Jordan. 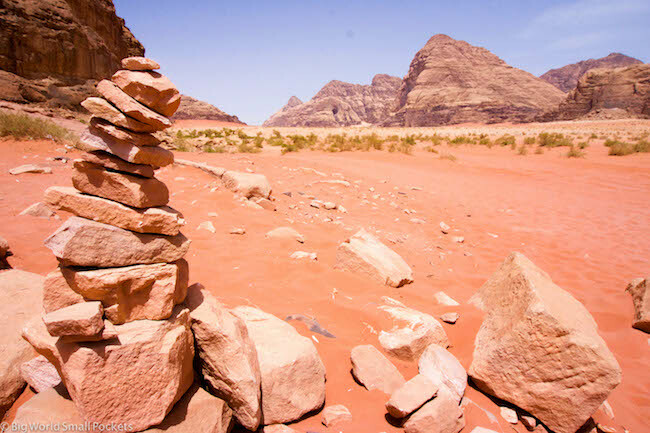 The first thing to know when it comes to backpacking Jordan is that, unfortunately, it’s not as cheap as you’d expect. Or at least, it’s not as cheap as I expected. With even budget accommodation coming in as much more expensive than Egypt or Turkey, tours and entrance fees here soon mount up. And you can forget about having a beer once you see the price too! 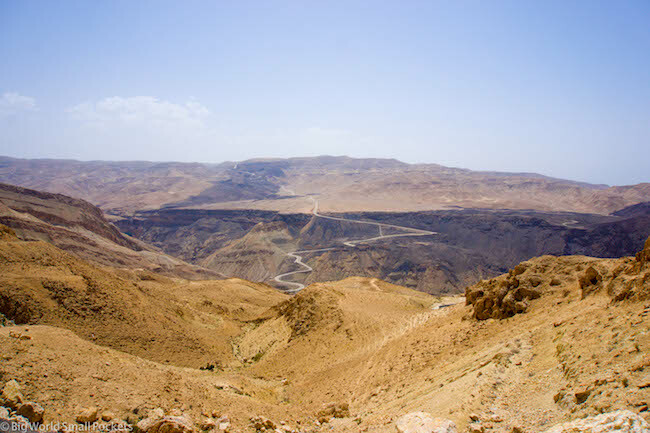 However one way to save money is to invest in the Jordan Pass before you get to this country. Including the price of your visa (although do check the nationalities eligible), as well as entrance to Petra and tons of other historical attractions in the country, there’s no question this tourist pass is a great money-saving option. To give you some idea, the entrance to Petra for 1 day comes with a steep $70 USD (50 JD) entrance tag (cue GASPS! 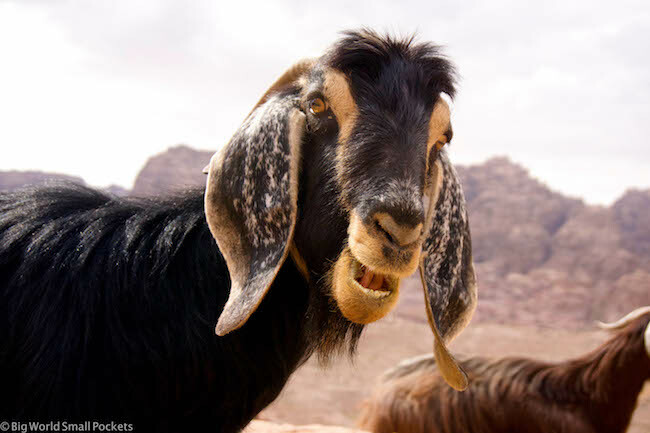 ), but buying a Jordan Pass gives you a 1 day entry ticket for Petra + your Jordan visa normally $56.50 USD (40 JD) + entrance to a whole heap of other Jordan attractions for only $99 USD (70 JD). You can also buy an upgraded Jordan Pass for $106 USD (75 JD) which allows you 2 days in Petra + all the other benefits, again easily helping you to offset the $77.50 USD (55 JD) fee for a 2 day standalone Petra entrance ticket. 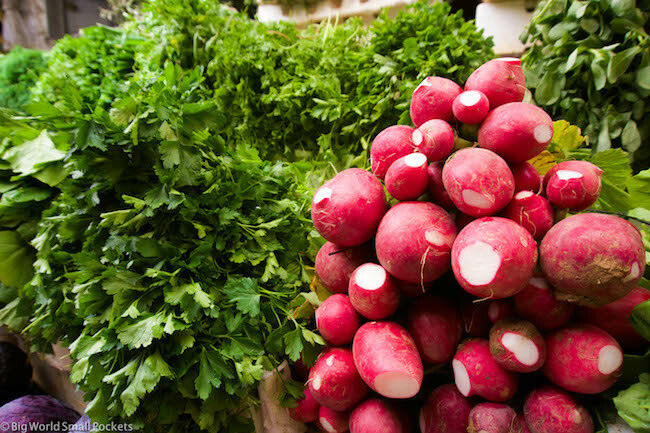 Another way you can save money when you backpack Jordan is to eat local. 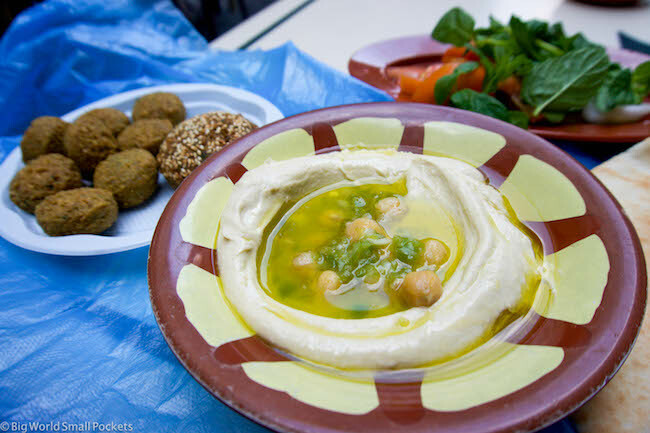 By this I mean, head down the side streets in any town and city to find small cafes and street stalls selling delicious falafels, juices and more. My favourite place in Amman sold a huge falafel wrap with salad, hummus and fries for only 50c. And trust me, that is an absolute bargain compared to a sit down tourist restaurant. Of course, another great choice is to pick a hostel that includes free breakfast and stock up! If you’re looking to balance costs with exploring Jordan, then I’d suggest 10 days as the perfect amount of time to spend in this country. 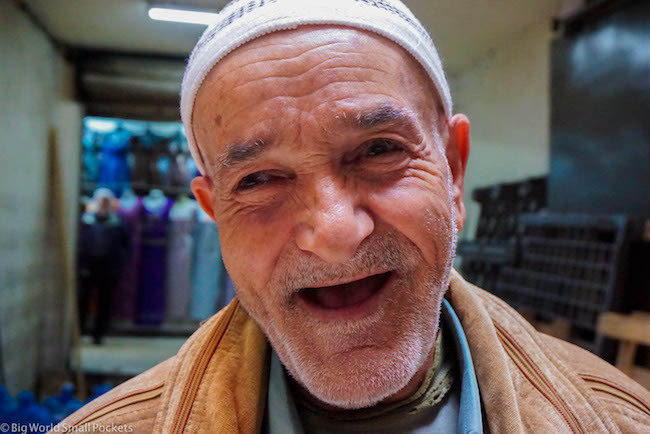 Being a small nation, it’s easy to get round Jordan in this time and see almost everything, but with less than 2 weeks, and if you watch your cash, you won’t spend a fortune, making it a nice balance. 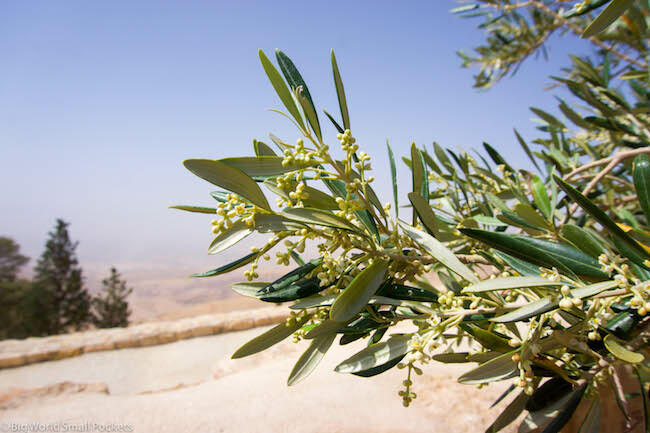 Check out my perfect 10-day Jordan itinerary for more info. So as well as being small, Jordan is also very safe. And for the Middle East, it’s also very stable. This does make it a great introduction to backpacking in this part of the world, as generally it’s easy to get around, you won’t be hassled and the local people are insanely welcoming. 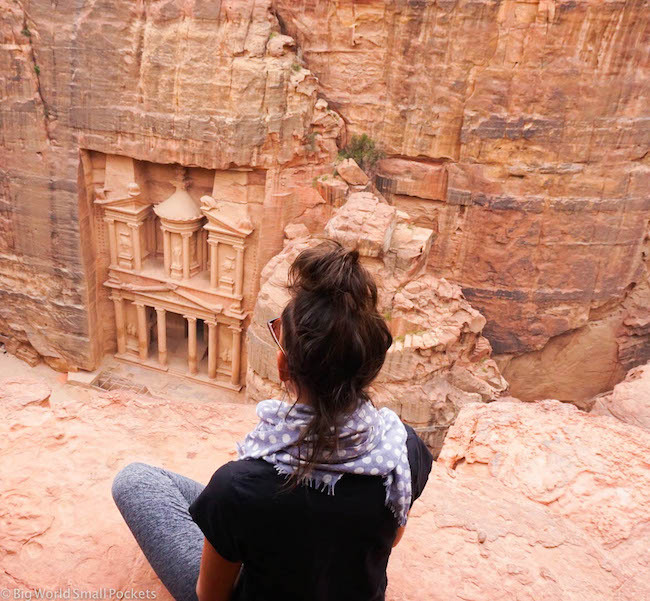 Having travelled here as a solo female, I can also attest firmly to the fact that Jordan is a very easy country for single ladies to backpack in. If you’ve bought the Jordan Pass and you’re from one of the countries whose visa entry is included in this, then entering Jordan is straightforward. And if you’re travelling from another Middle Eastern country, such as Egypt or Israel, it’s worth noting that land / sea borders to both these destinations are open. Do just check the border times however to avoid crossing on holy days or holidays when things are either totally closed, shut early or invariably very chaotic! Failing that, the other main point of entry for those who want to backpack Jordan is via the international airport in the capital Amman. Modern, clean and efficient, the airport here is easy to navigate and there’s regular flights from many European destinations, as well as other Middle Eastern countries and Africa. Flights aren’t always cheap however – a fact exacerbated by the Syrian crisis, which means land crossings from countries such as Lebanon is now impossible. However, there are many budget flights available from Turkey, particularly with the airline Pegasus, which makes Istanbul one of the cheapest places to access Jordan from. And you won’t even realise it until you get to Petra and see how huge this place is. Because it’s massive and with all the snaps you’ll want to take and all the trails you’ll want to hike, spreading the huge distance and large amounts of walking out over 2 days in this Red Rose City is going to allow you to enjoy it a lot more. 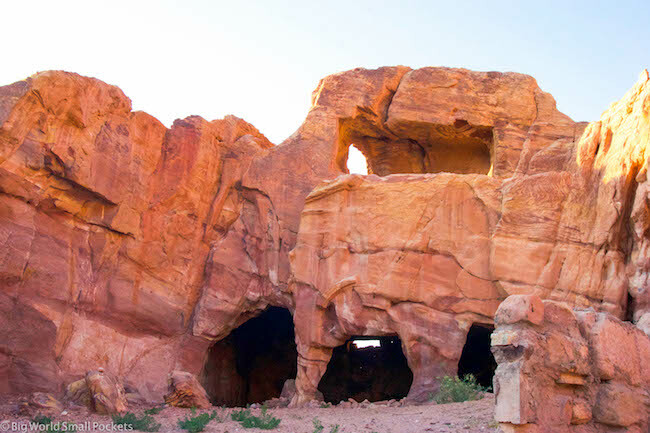 As such, I recommend the Jordan Explorer Pass, which includes 2 days entrance to Petra and which I’m delighted I paid the little bit extra for. 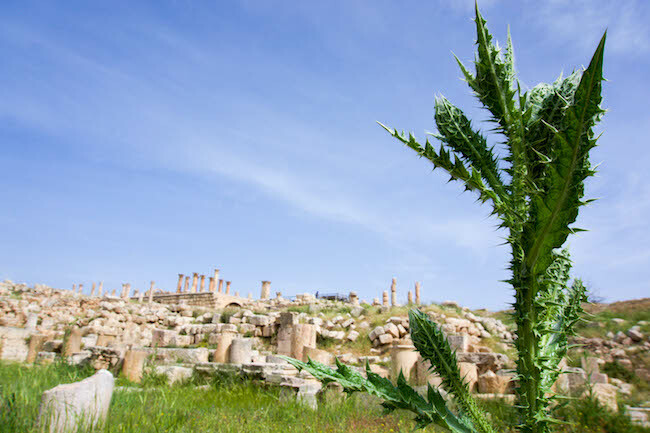 #1 Jordan Lonely Planet – An excellent resource when it comes to finding out the history of what you’re seeing in this country without the need for a guide, the Jordan Lonely Planet is a must. #2 Head Lamp – Great for taking into ruins or tombs to get an even better look at the amazing engravings or mosiacs and for any power cuts you may experience. I love my Black Diamond Storm, which served me super well in Jordan. 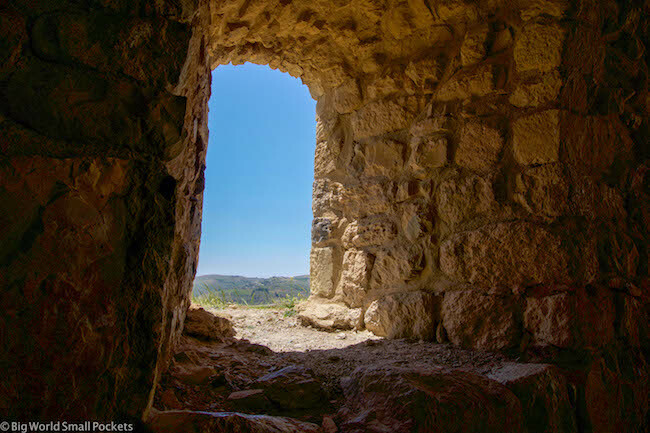 #3 Sun Hat – Trips to Roman ruins, crusader castles and Petra will mean many hours in the hot sun of Jordan. Do yourself a favour and bring a wide-brimmed hat to protect you. I love this Hello Sunshine design. 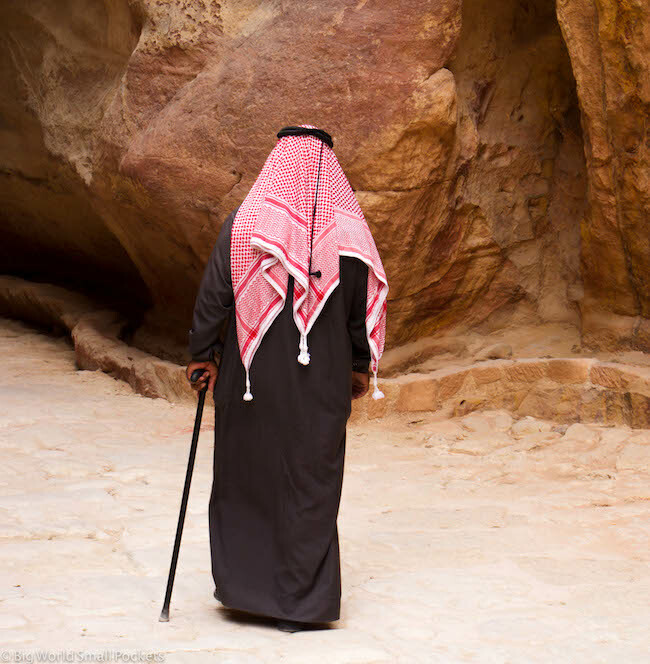 #4 Long Thin Trousers – While Jordan isn’t a super strict Muslim country, you’re unlikely to feel comfortable walking around in anything too short. As such a pair of long, thin cotton or linen trousers provides the perfect attire for this hot country. #5 Travel Insurance – A good idea whenever you travel in the Middle East, I love Travel Insurance from World Nomads and have used them throughout my time in Jordan and beyond. So the ideal time to backpack Jordan is definitely the Spring. Feb – April is a wonderful time in this country with great daytime temperatures and cooler evenings that still allow you to sleep! As long as you avoid major holiday times such as Easter and school breaks, prices are also quite cheap at this time and most of the historical sights not too crowded! 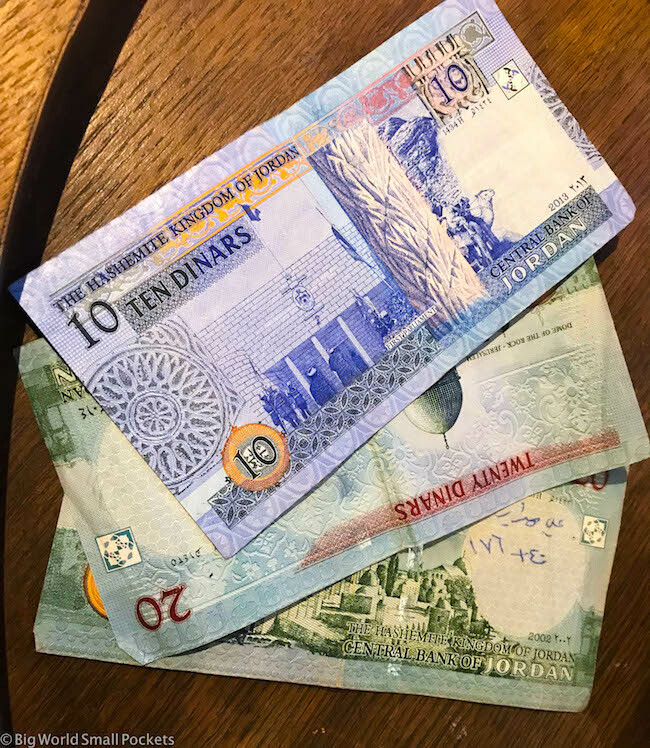 The currency in Jordan is the Jordanian Dinar or JD, which is actually worth more than 1 USD and is roughly equal to £1. That’s one of the reasons why travelling in this country isn’t super cheap. Get some JD ahead of your arrival if you find a good rate, or bring some USD or EUR cash to change while you are here. Otherwise wait until you are in the country to use your ATM card. Just don’t change any money at the airport… of course! Talking of ATM use in Jordan, it’s a crippling shame for us budget travellers that Jordanian banks charge a crazy 5 JD fee to withdraw money from them. This is of course in addition to the foreign exchange fees and any charges from the bank in your home country. Sadly it all adds up rather too quickly. That said, I did manage to find 1 local bank that didn’t charge the 5 JD transaction fee and that was the ABC Bank. Seek one of them out in Amman and withdraw as much as you can! Otherwise there’s plenty of foreign exchange offices in the capital you can use if you’ve come prepared with USD or EUR cash. Most of us who backpack Jordan these days, or anywhere for that matter, want to get a SIM card so we can use social media and keep in touch with people as much as we want. There’s a couple of telecommunication companies in Jordan, but I highly recommend Zain, who I got my SIM through as they were efficient, helpful and had excellent network coverage across the country. This more than lasted me the 3 weeks I was in the country, especially because all hostels have free wifi too. 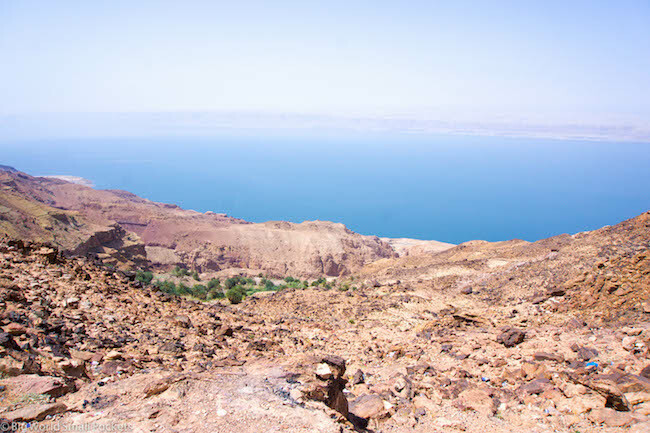 Another thing to note if you want to backpack Jordan is that there isn’t a huge amount of public transport – especially to more off the beaten track destination such as nature reserves, the Dead Sea or the eastern desert. 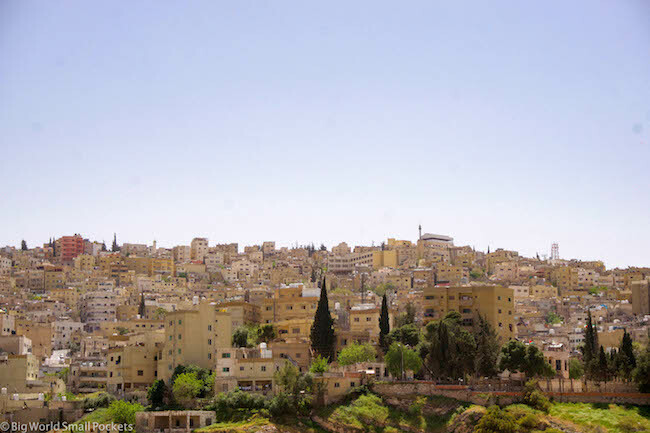 As such (and kind of unbelievably) the cheapest way to access many of these spots is via budget tours arranged by some of the larger hostels in the capital Amman. 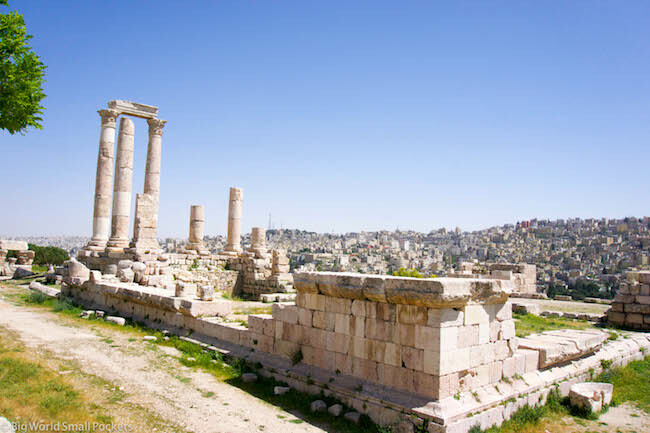 Normally I’m not a fan of organised tours, but I highly recommend the tours run by Jordan Towers, Amman – the great backpackers in Amman where I stayed – who group together budget travellers and provide them with a local driver and itinerary – simple, affordable, enjoyable and highly informative. #14 Beware the School Groups! 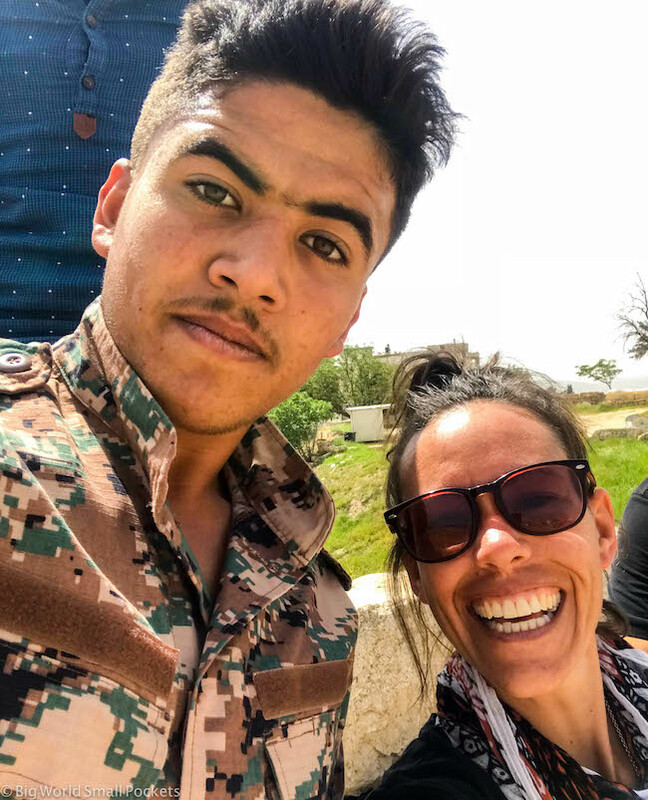 Maybe one thing to bear in mind when you’re sightseeing in Jordan however – particularly at many of the historical sights – is that you will run into loads (and I mean LOADS) of school kids. It’s wonderful that local Jordanian children get the opportunity to see and experience their country’s treasures (don’t get me wrong) but the noise and chaos can be an interesting accompaniment to your day! And on that note about school children, prepare to be asked – as a tourist – for a million photos a day when you backpack Jordan. And it’s not just school children that will want a selfie with you; local officials, shopkeepers, guides, families and members of the armed forces will also want to get in on the action too! It’s European pin plugs that are used throughout Jordan, so do not travel here without your European adapter if none of your appliances are currently suitable for these plug sockets. Thankfully, unless your Arabic is way better than mine, you’ll be delighted to find that the level of English spoken in Jordan is excellent, especially within the tourism industry here. Many other local people want to practice their English and, as a tourist, you’re likely to be stopped in the street and asked many friendly questions on a regular basis, both out of curiosity and peoples’ desire to practice their language skills. That said, it doesn’t hurt to take an Arabic phrasebook along with you to try and learn a few simple greetings in Jordan either. Jordan is a Monarchy and everyone here LOVES the king and his wife! The current King is actually half British, which means attitudes to Europeans and Brits in particular is extremely welcoming across Jordan. The Queen even has her own Instagram account if you want to follow along! One of the most frequent questions when people want to backpack Jordan is about dress standards. And while this is the Middle East and most people here are deeply religious, dress codes are not super strict. By this I mean, non-Muslim women certainly do not have to wear a headscarf, but by the same token you’re likely to feel out of place with bare legs and revealing clothing. Most of the time I was backpacking Jordan I opted for trousers and a T-shirt, plus a scarf around my neck. This meant my legs, shoulders and neckline were covered, but arms and head were exposed enough to keep cool! 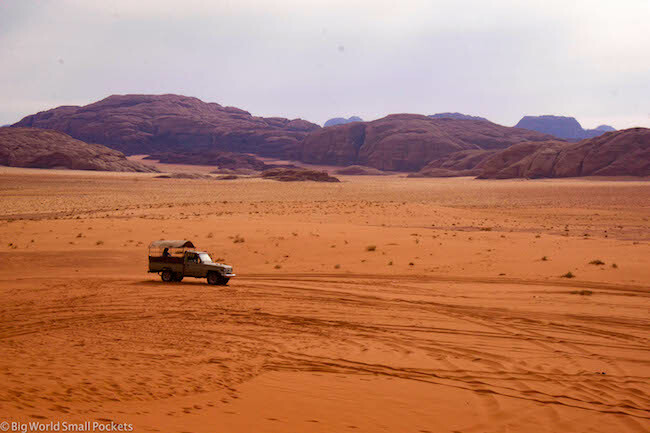 When it comes to travelling to Jordan’s main tourist destintions, there are some cheap transport options that definitely help us shoestring adventurers. 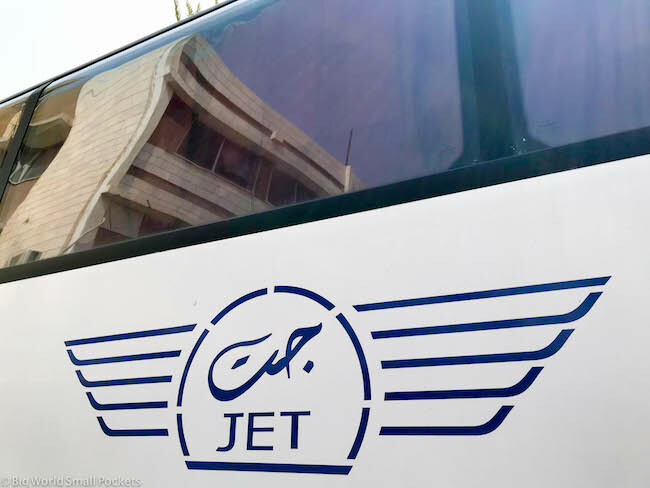 First up is Jordan’s main coach company – Jett Bus – who operate a regular timetable across the country in relative comfort. An example of the Jett Bus prices I experienced were 1) Aqaba to Amman for 7 JD and 2) Amman to the King Hussein Bridge for 11 JD. The other option is to use local minivans to shuttle around the country. These are by far the cheapest option, but are irregular, infrequent and unreliable to say the least. As per usual, when in countries such as Jordan, the minivans only run when full, so you may be waiting a while until they leave. If you have time on your hands however, this shouldn’t be a problem. Just make sure you set out early when you go to catch one as most only operate before lunchtime. 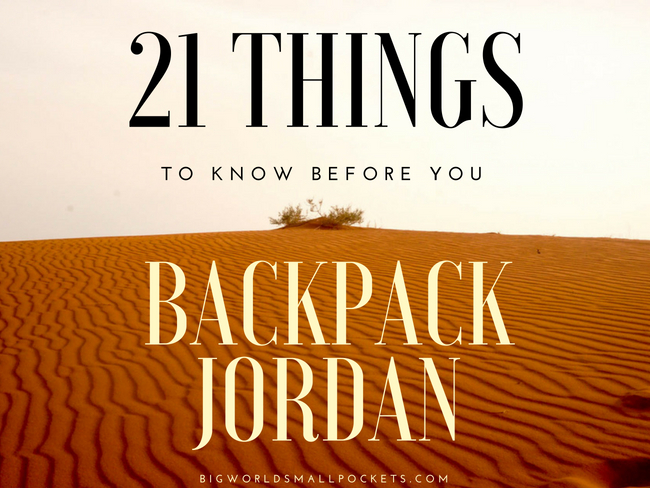 So that’s my list of the 21 things to know before you backpack Jordan. 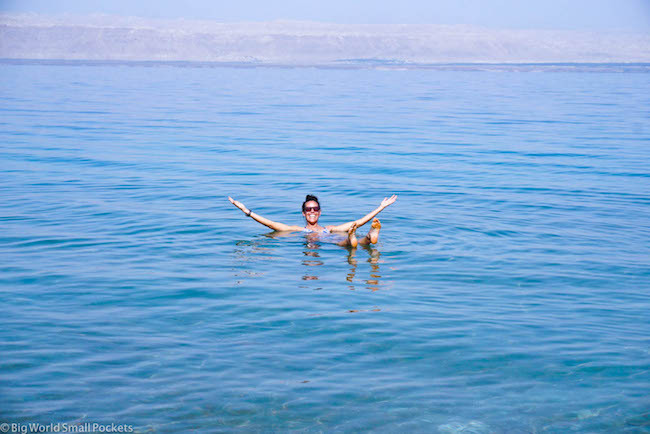 Have you visited this delightful Middle Eastern country? What’s your number 1 tip for other travellers here?